Going through the day with puffy, itchy, irritated eyes is a pain… in every sense of the term. Besides being super-uncomfortable, puffy eyes are also something you don’t want to show to the world. Thankfully, natural remedies abound. And many of these healers can be readily found in the kitchen at home. However, remember that all puffy eyes are not created equal. Causes run the gamut from a late night to allergies, hormones, weather or fluid retention due to excessive salt or alcohol. And the remedy needs to follow the underlying reason. So, first try and ID your problem, then choose the cure from these easy home treatments. Sleepless night? Cold water is the best bet. And it’s so simple that even your sleep-addled brain can manage: just rinse your face with several splashes of cold water. Or take a small bag filled with ice, wrap it in a washcloth and place it on your eyes. The chilled texture will help constrict blood vessels and lessen swelling. Repeat as necessary throughout the day until puffiness is gone. PS: In a pinch, wrap a bag of frozen vegetables in a thin towel and place it over your eyes for 10 minutes. It will work just as well as the ice! Witch hazel has tannic and gallic acids that are brilliant at reducing inflammation. Rosewater, on the other hand, is a cooling and aromatic astringent that contains both antiseptic and antibacterial properties. 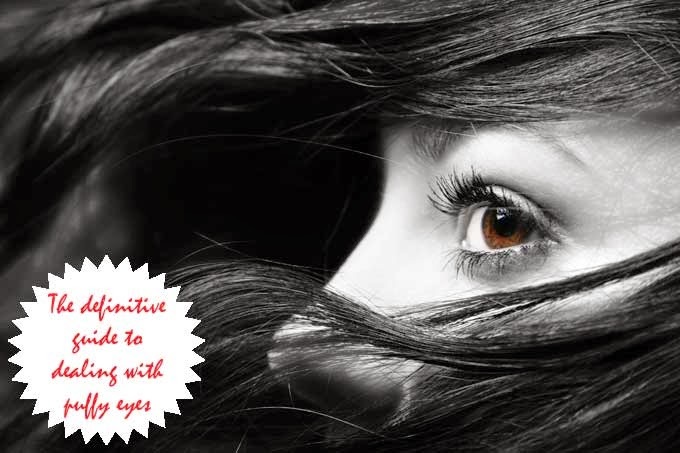 And using them is simple: soak cotton or wool pads in these astringents and leave pads on the eyes for 15-20 minutes. They’re a cliché for a reason: cucumber’s soothing qualities, astringent properties and high water content help put you on the fast track to brighter peepers. Lean your head back, rest a slice on each closed eye, and relax for 5-10 minutes to reap the de-puffing benefits. If your eyes are puffy and itchy due to an allergic reaction, cold spoons will constrict the irritated blood vessels, while also reducing redness and swelling. Simply place 2 teaspoons in the refrigerator. When they are nice and chilled, lie down, close your eyes, and place one spoon (curved side down) on each eye. As the spoon warms, replace it with a cold one from the fridge. Another option: the common potato. This has been a staple in European folk medicine for soothing allergy or illness-riddled peepers. The logic? Potatoes have astringent qualities. Plus, the high level of starch can have an anti-inflammatory effect. Peel a potato, then wash and dry it thoroughly. Grate it as fine as possible, place the pulp in a clean cloth and fold to make a poultice. Place the poultice on your eyelids for 15 minutes. A heaping portion of fries, Parma ham pizza and other salt-intense foods can cause puffy eyes. However, salt by itself does the eyes good. Mix 1/2 teaspoon salt in a glass of warm water; make sure the water is not too hot. Soak cotton balls or facial pads in this solution, lie down and apply them on your eyelids for a few minutes. Rest in this position for at least 10 minutes while keeping the pads in place. You’ll arise with deflated eyes. Aloe vera’s antioxidant and vitamin E content make it excellent for improving blood circulation and flushing out excessive fluids from around the eye area. Simply apply aloe vera juice or gel under your eyes, making sure that it does not touch the inside of your peepers. Leave it on for the day. Water is again the saving grace here. But this time, you need to pour it down your throat. That’s because when body is dehydrated, it acts much like a camel, storing water for the long haul across the desert. Instead of a camel’s hump, you’ll develop water reserves around the eyes. By keeping yourself adequately hydrated, the body isn't put into survival mode and won’t puff up in all the wrong places. So, make sure you drink at least eight 8-ounce glasses of water day, and don’t substitute sodas, coffees, or sugary drinks as they are extremely dehydrating. If, like me, your eyes puff up at that time of the month, look for nettle tea. It contains anti-irritants that soothe redness and inflammation. First, drink the tea. Then, lie down, close your eyes, and place a tea bag over each eye. Let cool until the bags are comfortably warm to the touch. The eye tissue becomes weaker with passing years, thereby leading to puffiness in this already-fragile area. The alpha-hydroxy-acids present in strawberries can make skin smoother and tighter. 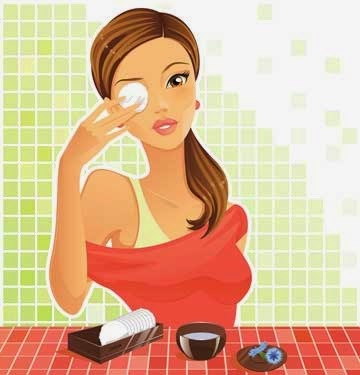 At the same time, they can also reduce under-eye puffiness and swelling. Keep a couple of strawberries in the refrigerator for half an hour. Then remove their tops and slice them into thick pieces. Now lie down and place the slices under the eyes for several minutes. Do you often find yourself dealing with puffy eyes? How do you tackle them?